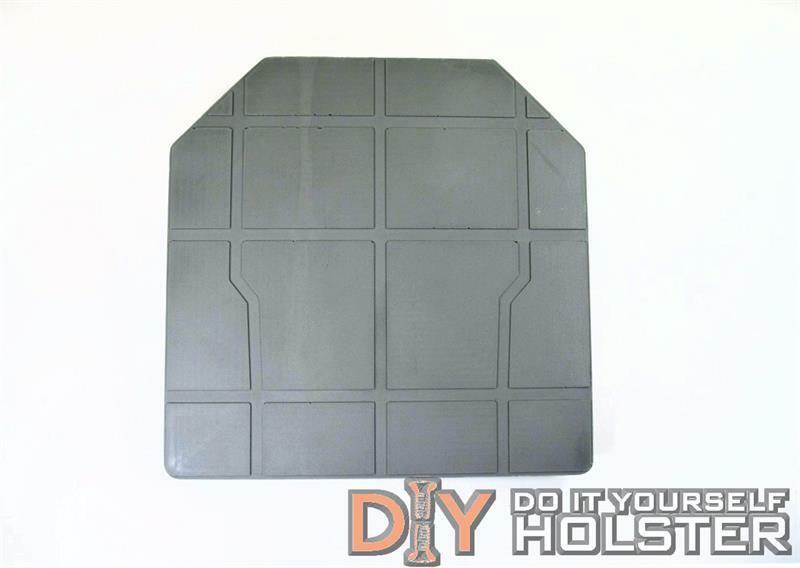 The latest in vacuum forming tech is now available here at DIY! Our Pro Drones harness laser scanning, CAD design and CNC manufacturing to produce a truly master template. Doing so allows us to account for material shrink in the casting process, add complex functional features and provide dead accurate CNC precision - all at an "old school" drone price. Why "Moth" Drones? We figured using this grey tool at night is what many of our customers will do, so "Split" or "Butterfly" didn't set the right mood. "Bat", "Raptor" and "Rorschach" were considered, but we like "Moth" and we're sticking to it. Moth Pro Drones are purpose built for vacuum forming fold-over/taco style holsters. They will work with any pressure, membrane or non-membrane former including our Pro Press tooling. All of the vertical surfaces are properly drafted to prevent die-lock and allow easy material removal after forming. We have placed very small dimples on the surface of the mold as drill guides. 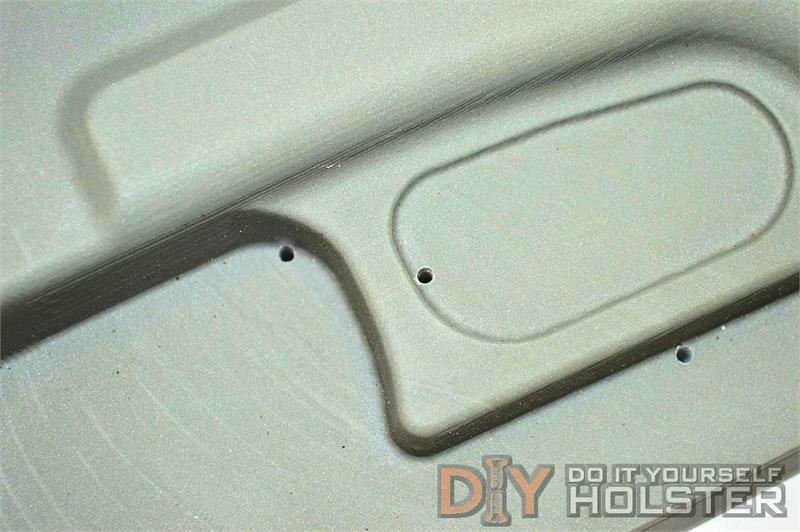 By drilling strait down through these points with a 1/16" or similar size drill the vent holes created will intersect with air evacuation channels on the underside of the mold. This allows you to completely evacuate the air under the material and mold without strings, mesh or other porous spacers. Just place the mold over a hole in your vacuum table surface and go. Moth Pro Drones will work with any generation of Glock pistol. All catch points have been filled and control and sight channels are built in. The spacing of the two halves is sized to create a sight channel that will accommodate any size sight, including suppressor sights. These drones are easily workable, so if you want to make custom alterations it is no problem. 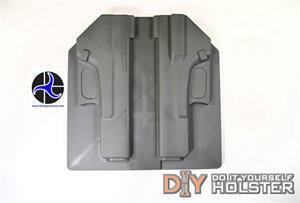 Feel free to saw, sand, cut, drill, carve, Bondo and glue alterations as you see fit. 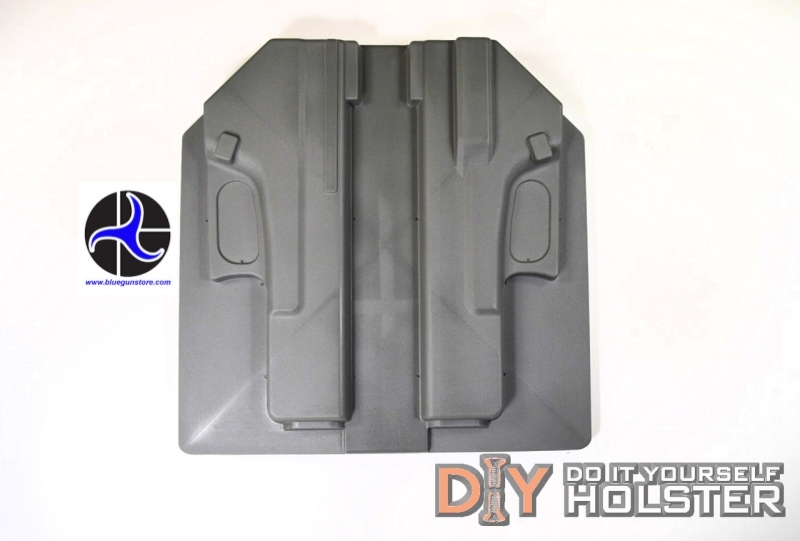 Other options include using a finished holster shell as a template to cut a Pro Drone into a router trimming fixture for the ultimate in streamlined production. Our goal is to make it easier to find the perfect holster when you Do It Yourself! DISCLAIMER: “GLOCK” is a federally registered trademark of GLOCK, Inc. and is one of many trademarks owned by GLOCK, Inc. or GLOCK Ges.mbH. 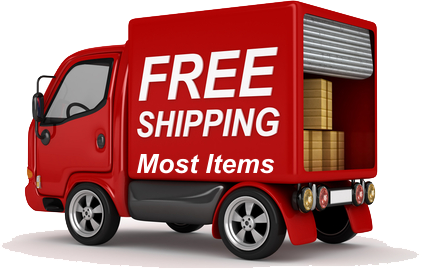 Neither DIY Holsters nor this site are affiliated in any manner with, or otherwise endorsed by, GLOCK, Inc. or GLOCK Ges.mbH. The use of “GLOCK” on this page is merely to advertise the sale of GLOCK pistols, parts, or components. For genuine GLOCK, Inc. and GLOCK Ges.mbH products and parts visitwww.glock.com.